002001V09 Precision Cirlclip Plier Set Four precision circlip pliers in foam tray for workbenches and tool trolleys Clearly organised storage of tools Precisely-sized recesses for holding the pliers Foam tray dimensions (W x H x D): 335 x 165 x 33 mm Material: two colour, closed pore foam ATTRIBUTES: Barcode: 4003773073291 Style Precision Cirlclip Plier Set External circlipInternal ring Weight: 820g ITEM CONTENTS: 1 Precision Internal Circlip Plier 4811J2 1 Precision Internal Circlip Plier 4811J21 1 Precision External Circlip Plier 4911A2 1 Precision External Circlip Plier 4921A21. 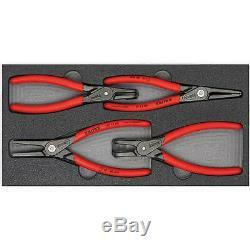 Precision Cirlclip Plier Set Knipex 002001V09 Dim: (WxHxD):335x165x33mm. 002001V09 Precision Cirlclip Plier Set. Four precision circlip pliers in foam tray for workbenches and tool trolleys. Clearly organised storage of tools. Precisely-sized recesses for holding the pliers. Foam tray dimensions (W x H x D): 335 x 165 x 33 mm. Material: two colour, closed pore foam. On rare occassions this may not be possible due to circumstances outside our control. If this is the case we will contact you to explain the reason for the delay. Wahankh Pty Ltd trading as Blue Bar Industries and Aussie Online Bargain Warehouse is an Australian and Operated business and abids by Australian retail laws. We are continually expanding our range and offer our customers a quality product at a reasonable price. A large selection of our products are manufactured under our own brand "Blue Bar" and all other products come from reputable manufacturers. Wahankh Pty Ltd Blue Bar Industries Aussie Online Bargain Warehouse Find us on Google. Wahankh Pty Ltd trading as Blue Bar Industries acn: 167 220 902 We are an Australian owned and operated company located in Caboolture QLD. Auctiva offers Free Image Hosting and Editing. The item "KNIPEX Precision Cirlclip Plier 4pc Set Knipex Trade Quality Tools Electrical" is in sale since Thursday, May 10, 2018. This item is in the category "Home & Garden\Tools & Workshop Equipment\Hand Tools\Pliers". The seller is "blue_bar_industries" and is located in Caboolture. This item can be shipped to Australia, North, South, or Latin America, all countries in Europe, all countries in continental Asia, New Zealand.